When Sue Mikelson suddenly heard a commotion in the middle of the night on Wednesday, she thought it was just her dog and cat playing around. Before long, though, the two pets came bounding into her bedroom — chasing a very confused raccoon. The raccoon had somehow broken into Mikelson’s house in Florida, and her dog and cat were quick to greet the unwelcome visitor. 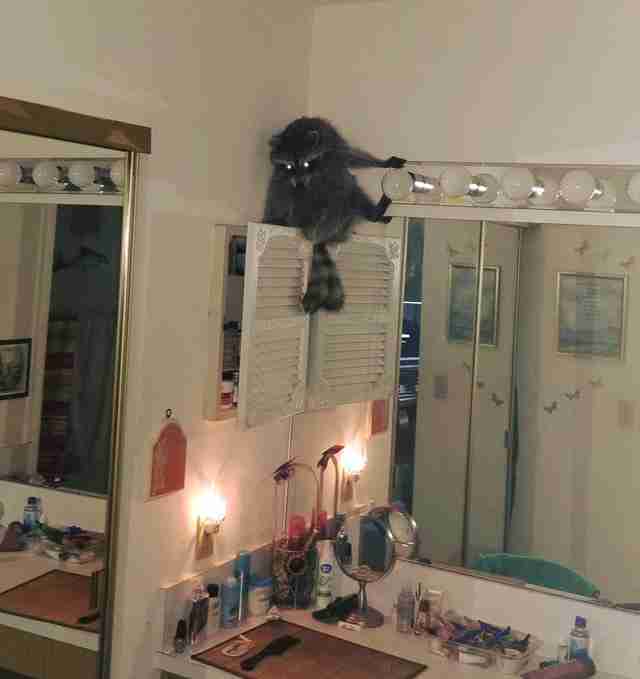 Terrified of the two animals and incredibly confused about what was happening, the raccoon dashed through the bedroom, climbed on top of Mikelson’s vanity, and refused to come back down. Unsure of what to do, Mikelson first tried running to her neighbor’s house to see if she could help. The two women tried using bread to entice the raccoon to come down from the vanity so they could then lead him out of the house, but even when presented with food, the raccoon refused to move. That’s when Mikelson decided to call the local police department in hopes that they could help. … but first decided to snap a few selfies with the masked intruder, in order to remember the very unusual call. Luckily the raccoon wasn’t hurt and was in good condition, so the officers were able to release him back outside. The raccoon ran back off into the wild, and hopefully he’ll think twice before trying to sneak into someone’s house again.